If you travel to New York City on business like I do, you may often find yourself staying at a hotel in Midtown somewhere near Times Square. It’s happened to me more than a few times, and I’ve identified 8 great places to eat within walking distance of Midtown Manhattan that are delicious and fun. Depending on your mood, you may want to take in more than one of these drinking and dining establishments. 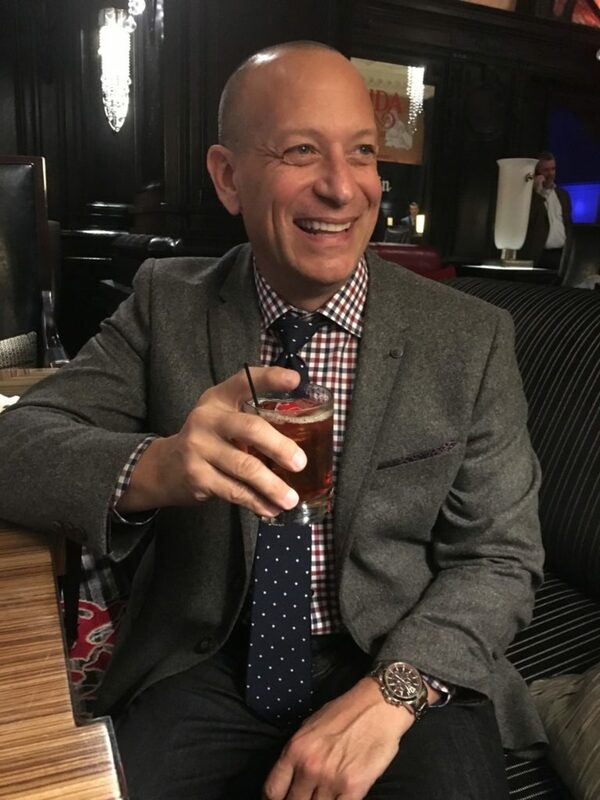 Recently from my hotel room at The Royalton on 44th between Fifth and Sixth, I walked just a few New York blocks to the amazing places I am sharing with you here. Lambs Club – The Lambs Club is a great little jewel box for lunch, with some captains of industry and celeb sightings occasionally. I like it because it’s tucked away inside the luxurious Chatwal Hotel, and very private. In the evenings, the bar GOES OFF. There is often a jazz trio with a singer showcasing some of the old standards, and they make a mean dry-Belvedere-martini-up-shaken-not-stirred-with-two-olives. 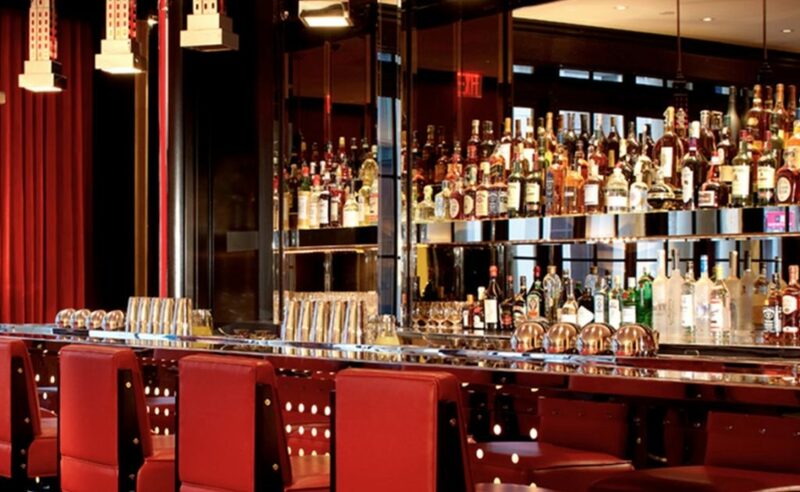 The bar at the Lambs Club on 44th and 7th is so much fun! Milos – Milos New York served up the best Greek meal I have had outside of Greece. With multiple locations around the world, Estiatorio Milos was founded by acclaimed chef Costas Spiliadis. 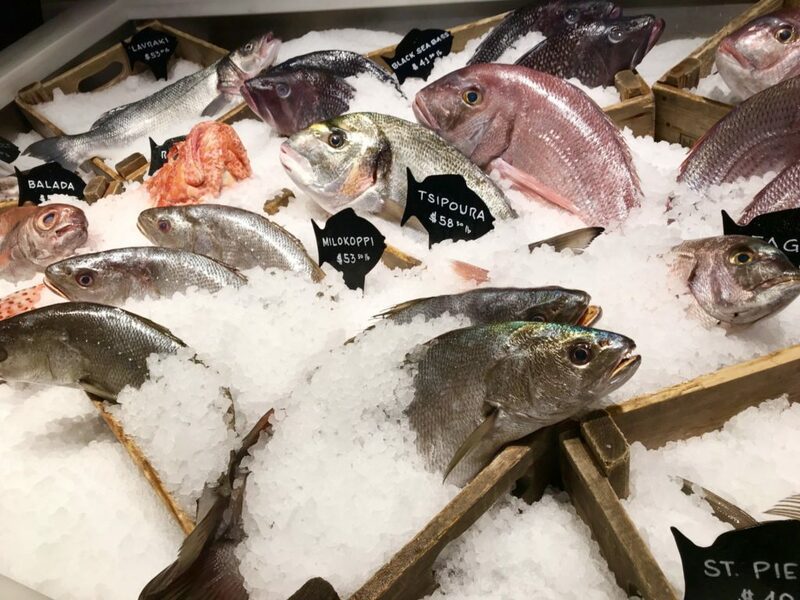 The whole fish are flown in fresh from the Mediterranean seas, and tasted out of this world. Great decor, great vibe, great service – love love love this place. Milo’s featured freshly caught fish that had been flown in from Greece earlier that day. Shake Shack – I know, but it’s always soooooo good and sometimes you just need a quick burger for lunch between meetings. 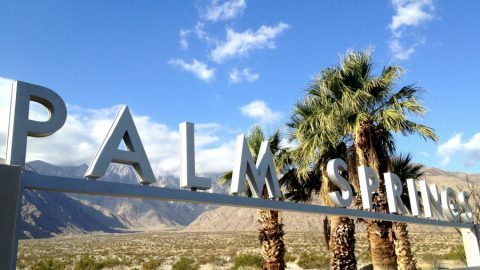 We got ours to go, and took our Shake Shack bags filled with fries to the hotel lobby and chowed down on delicious greasy hangover-curing burgers and vanilla shakes. Delicious and so bad it’s good. Sometimes you just need a good burger, and Shake Shack never disappoints. STK – If you like a good steak dinner with a hip factor, then STK is a great choice in Midtown. The interior booms with the beat of house music, celebrations are running high and the energy is fierce. Definitely a place to dress for the see-and-be-scene crowd, and the food is really delicious. The menu was so enticing, we ordered way too much and practically rolled out of there and on to the sidewalk. Michael Jordan’s The Steakhouse NYC – The namesake basketball icon has a pretty fine restaurant on the mezzanine level of Grand Central Station. I like to sit at the bar at Michael Jordan’s The Steakhouse for drinks before heading elsewhere for dinner, because the people watching is top level. And you are sitting amid understated elegance inside Grand Central Station! How many movies have been shot in this place, lovers reunited, careerists rushing to get to the office or back home to their cozy houses in Connecticut. Joe’s Shanghai – Ok this place is the best thing ever, although from the street it doesn’t look like much. Don’t worry, the food is crazy good. Dim sum is the specialty at Joe’s Shanghai, and they are known for their soup dumplings – little pods of goodness served on a spoon with insides filled with delicious soup. You bite a corner and slurp the soup first, then eat the dumpling. It’s making me crave them just writing this. 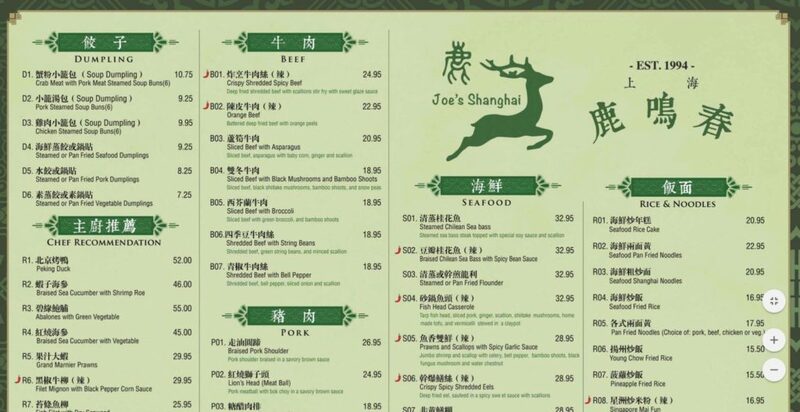 The menu at Joe’s Shanghai is impressive, but you can always let the chef choose! 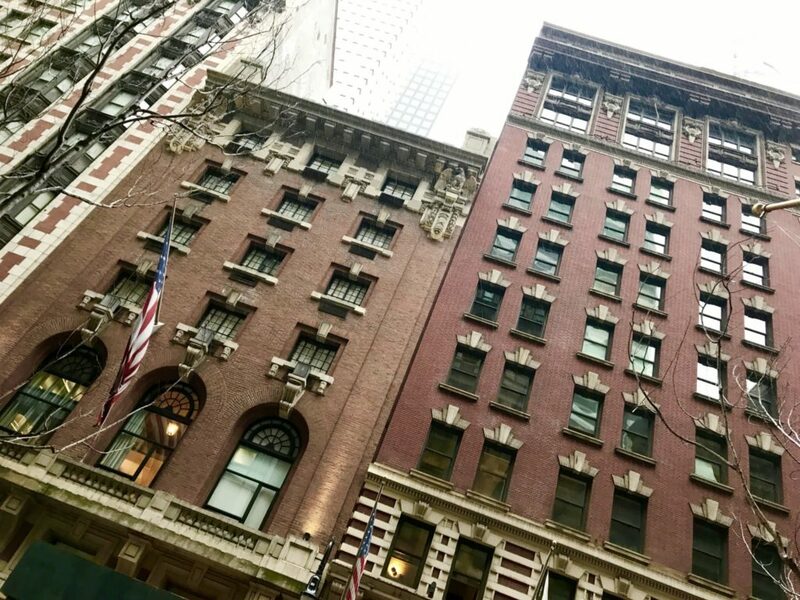 Algonquin Hotel – The famous Algonquin Hotel is quintessential New York, and original home to a literary crowd including the likes of Dorothy Parker, Franklin Adams, Robert Benchley, George Kaufman and Edna Ferber to name a few. Much of the original New York charm is intact, and it’s a lovely place to order a Manhattan and sit in clubby chairs imagining yourself back in the 1920s. Sitting in the lobby bar at The Algonquin Hotel, having a Manhattan in Manhattan. Secret Burger Joint – Located behind a thick curtain inside the lobby of the Parker Meridien Hotel, the Burger Joint is a no-frills, cash-only respite in a sea of expensive meals and high fashion. The cheese burgers and fries are the perfect late night snack after the theater (or really at any time). Expect to wait on line a bit, but the food is definitely worth it. 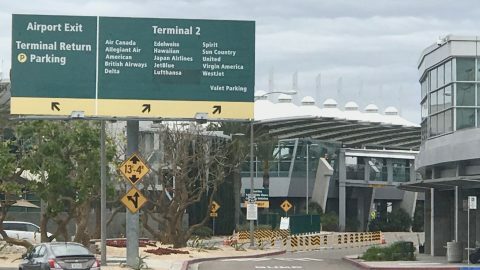 You could be sitting next to a woman in full-length fur and across from a construction worker on his break from the site. Local color! And the best thing about all these 8 great places to eat within walking distance of Midtown Manhattan? Using The Royalton as your centerpoint, the farthest you will have to walk is 11 blocks (to Milo’s). I’m sure you’ve got your own favorites – what places should we hit up the next time we are in NYC? A nice variety of suggestions! I am saving this post in my evernote for my next trip to New York! I hope so too – it’s classic Manhattan! Nice list of recommendations. 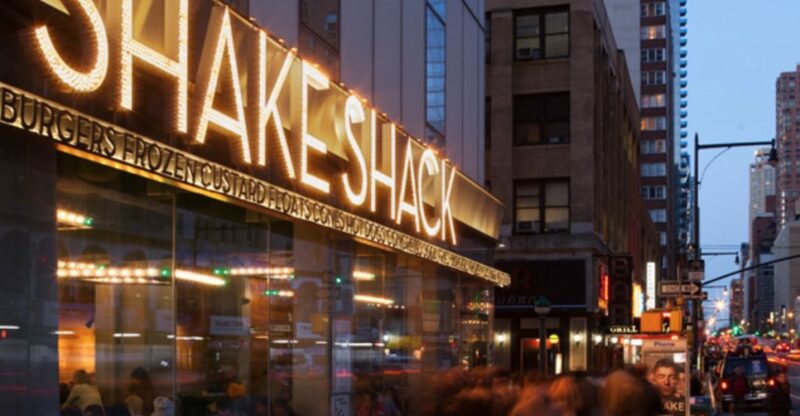 I would like to try out Shake Shack. Hope you get a chance to try it – don’t miss the vanilla shake!